I think this dialog lacks some buttons: obviously "Nope" and droplist "Remind later" with variants (Remind the interruption in 1, 5, 10, 30 minutes, 1 hour) which will either remember the last chosen variant or select it according to the quantity of processing files (maybe showing the progress or calculated time upto the end of operation). The second proposition is obvious, too. And it has been probably mentioned many times, I'm sorry for repeating. I propose an option for "Index image attributes" (like width*height) and for "Export iFilter attributes to filelist" (EFU/CSV). Coz the most of this 1 million of images on my disks ain't changing for a very long period of time, and that's a good idea just to cache these images' attributes, so that next time the search will be performed in a mo. I don't care about extra 100 MBs that would be taken on diskspace to write this attribs, about RAM idc too (hope this will work fine on 8GB of it). 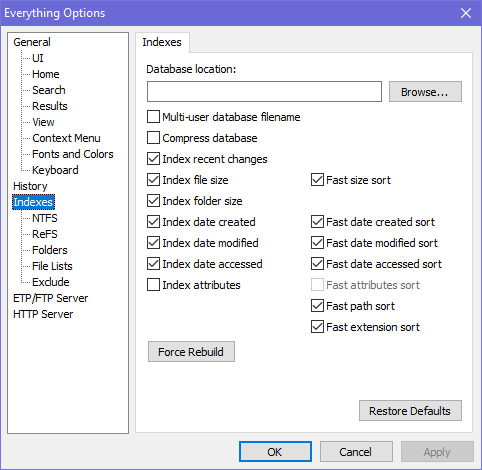 We need one more tab (for "Filelist Export") in settings and hope that David is already working on this extended dialog for ver. 1.5. Another indexing software WinCatalog 2017 Portable has some interesting options to store in its DB-file. 1st is to store user-defined amount of first symbols from text files (256 on the figure below), 2nd is to save titles from HTML-format files to DB/filelist. Many other features for me are interesting too. For ex., ability to import one filelist or the embedding of thumbnails of user's pictures to the database (option, and u can also set the size of thumbs or even remove them later from DB-file). User can define there which filetypes the app will take for textual ones and process them just like straight text. But this WinCatalog has very large DB (1GB+) and very slow search (in my DB with some disks and 14GBs of data incl. thumbs it performs a search in about 15 minutes, that's boring comparing to Everything that's searching anything instantly, just like FileSearchy). I hope, this options to process files (iso, rar, books, images, videos, texts, music, docs) sometimes will come to Everything and we'll can export 'em to filelists. 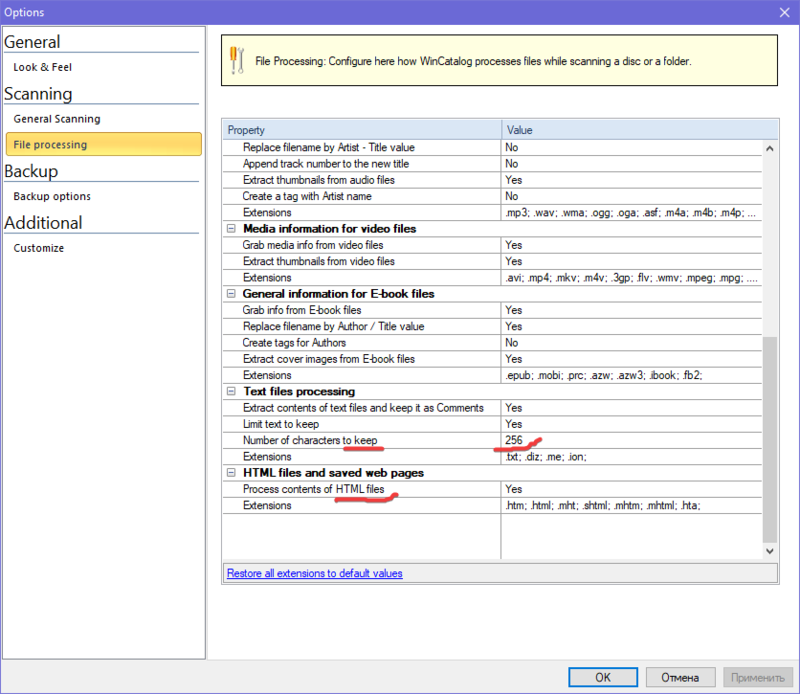 The Cancel current query dialog is shown when access to the database is blocked for more than 1 second. I agree it needs a OK and Cancel button. I'll consider a remind me dropdown. I'm working on indexing meta data for Everything 1.5. Exporting this information would also be added..
Storing on the first x bytes might be useful, I'll consider an option to do so. 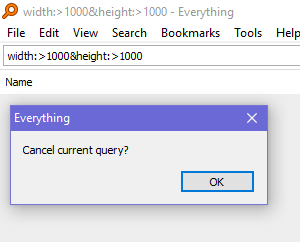 If you cancel the Cancel current query dialog (as in Escape it rather then OK it) is that the only time the query queries (as in if you step away, then back & if it's still busy, will you get the Cancel query again)?